Source: “Health aspects of Air Pollution” published by WHO Europe, June 2004. 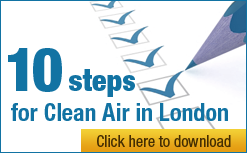 Clean Air in London’s (CAL’s) mission is to achieve urgently and sustainably at least World Health Organisation (WHO) recommended standards of air quality throughout London. CAL’s immediate priority is to see health-based air quality laws complied with in full each year up to the London 2012 Olympics (and thereafter). Air pollution in London is much worse than most of us have realised. It averages well over twice legal limits and WHO guidelines near our busiest streets. There are three main pollutants in ambient air: particulate matter (for example very fine particles from dust, tyre and brake wear and black smoke from vehicles), nitrogen dioxide (NO2) and street level or tropospheric ozone (O3). Sulphur dioxide (SO2) is no longer seen as a health risk in London. PM is classified by diameter as ultrafine (PM1.0), fine (PM2.5), coarse (PM2.5-10) and PM10 (with the last, for example, including particles up to 10 microns in diameter). The finest is thought to be the most deadly since it travels furthest into the bloodstream and the body. WHO guidelines typically include short-term mean (hourly for NO2 and daily for PM10) and long-term (annual mean) exposure levels to protect human health. There is no safe level for PM. In the calendar year up to 10 December 2010, annual mean and hourly peak concentrations of NO2 in Brompton Road, Kings Road and Marylebone Road were: 83 (micrograms per cubic metre or μg/m3) and 202 exceedances; 87 μg/m3 and 44 exceedances; and 98 μg/m3 and 539 exceedances respectively compared to the annual and hourly legal limits of 40 μg/m3 and 18 exceedances respectively. European Union (EU) legal limits are based on WHO guidelines. Evidence from the summer smogs of 2003 and 2006 suggests that air quality will deteriorate as climate change causes warming unless additional mitigation action is taken that anticipates this rising trend. Does it matter that air pollution in London is this bad? Definitely, yes. CAL showed the previous government was responsible for one of the biggest public health failings or ‘cover-ups’ by a government in modern history. For years we had been told there were 1,031 premature deaths due to air pollution in London in 2005 and some 12,000 to 24,000 per annum nationally. Research showed these estimates related to short-term exposure with the former due to PM10 and the range comprising 8,100 from PM10, 3,500 from SO2 and 700 to 12,500 from O3. It was very odd though that the United States’ Environmental Protection Agency and others had published estimates attributable to long-term exposure while the UK had not. With much help, CAL calculated there were 3,460 such deaths in London and 35,000 nationally in 2005. Parliament’s Environmental Audit Committee accepted these estimates saying: ‘Air quality must be given a higher priority for government. Defra must raise the profile of the issue by publicising the latest data on premature deaths more widely and making clear the benefits of improving air quality’. The Mayor of London subsequently published an estimate of 4,267 premature deaths in London in 2008 attributable to long-term exposure to PM2.5 and the new government has confirmed that the national calculations are correct. To put the above numbers in context, compare them with the number of people who died in London in the same period from road traffic accidents (i.e. 230) and the 617 people annually who are estimated to have died prematurely from workplace related passive smoking nationally before relevant legislation came into force. Each person dying prematurely due to poor air quality in London may do so up to nine years early (or worse). During London’s summer smog episode in August 2003 there were a total of between 46 and 212 premature deaths from O3 and 85 from PM10. London’s summer smog episode in July 2006 was likely to have resulted in a similar or greater number of premature deaths from O3 and a slightly lower number for PM10. These numbers should be of great concern to those planning for the Olympic Games and Paralympic Games in 2012. In summary, air pollution has been linked to cardiovascular and cardiopulmonary events as well as asthma, cancers and other health effects. Increasing obesity may make people more vulnerable to air pollution. The young and old are most vulnerable to poor air quality. What causes bad air pollution? The Mayor of London has said that road transport was responsible for 79% of PM10 emissions in central London and around 80% of PM2.5 emissions in London as a whole in 2008 and 41% of emissions of oxides of nitrogen (NOx) in London as a whole in 2008. Emissions from diesel engines are a particular problem. Empirical evidence published by the government suggests that, like for like, diesel engines for passenger cars may produce 17 times as much particulate matter and 83% more NOx emissions than petrol cars for a carbon dioxide (CO2) reduction of 4% or less. Diesel vehicles with pre-Euro 1 engines may produce more than five times as much particulate matter as diesel vehicles with Euro 4 engines. The other main sources of harmful emissions include power stations, domestic natural gas, quarrying, construction and (outside London) agriculture. The proliferation of festival bonfires has also recently been recognised as a cause of more frequent air quality problems. What are the likely solutions? We need mitigation and adaptation to tackle air pollution whether poor air quality or climate change related. Mitigation means walking or cycling or using public transport rather than driving (particularly diesel vehicles) where possible to reduce air pollution for yourself and others. Adaptation includes walking or cycling down side streets rather than busy arterial roads. Traffic related measures – which can be split further into: Fewer and Smaller vehicles; and Cleaner vehicles. It is simplest to consider two overlapping circles: one for measures to reduce congestion and one to reduce harmful emissions. Measures to reduce congestion include congestion charging and those to reduce harmful emissions include low emission zones (LEZs). The former can reduce emissions since vehicles travelling at 20 mph are roughly half as polluting as those travelling at 5 mph. The latter can reduce congestion by excluding some vehicles. Germany, for example, had some 40 inner city LEZ’s in place by the end of 2009 with Berlin saying its LEZ has been the single most successful measure to improve air quality in the city. Measures to promote walking, cycling and the use of public transport clearly reduce both congestion and emissions. CAL considers key solutions for London should include: the abatement of harmful emissions from buses and taxis; a Berlin style LEZ in inner London and around Heathrow; a boiler scrappage scheme; and a massive campaign to build public understanding of the dangers of poor air quality with advice on mitigation and adaptation. CAL is concerned that the Mayor’s focus on buying new buses now (even hybrid) may distract from the need to comply (cheaply) with air quality laws in the short-term (e.g. through the fitting of selective catalytic reduction devices to 80% of London’s 8,500 buses) and put infrastructure in place for a sustainable long-term solution (e.g. electric vehicles). It is clear that successive governments have continued to hope for some ‘silver bullet’ to solve air quality problems (e.g. technology solutions such as tighter emission standards for vehicles) while it is clear the cheapest and most successful solutions will require bold political action and behavioural change. Does the law protect us against poor air quality? Yes. Since 1999, EU legislation has required the UK, as a Member State, to achieve annual mean and daily limit values for PM10 (by 1 January 2005) and annual mean and hourly limit values for NO2 (by 1 January 2010). These standards are based on WHO guidelines for air pollution. While objectives are set by the EU, there are no limit values for O3 since it is considered to be a transboundary problem (although there are other obligations for O3 e.g. on health warnings). The NO2 hourly limit value for a whole year was breached in January 2010 and the annual mean for 2010 is certain to be breached by a large margin. The government says it plans to apply for a time extension until January 2015 to comply with the NO2 limit values in September 2011. Even if it is successful, the government must ensure that annual mean concentrations of NO2 are not exceeded by more than a maximum margin of tolerance of 50% from 1 January 2010 (i.e. 60 μg/m3). The scale and urgency of the challenge requires radical and urgent action to reduce air pollution. But if we succeed, we will show the world (and London) how to tackle air pollution and sustainability issues more widely. Let’s do it!